Remember when jeggings first started to become a trend? That was a truly magical moment for our closets. We’re still proudly under their spell and are forever excited when a new pair catches our eye. Currently, we can’t take our eyes off a top seller at one of our favorite shopping destinations, and we don’t even care if we’re caught staring. The Lyssé High Waist Denim Leggings are not skinny jeans. We know, it’s hard to believe. Sure, “leggings” is in the name, but look at them! How can they possibly be anything else but jeans? We’re no illusionists, but we need to know the secret. 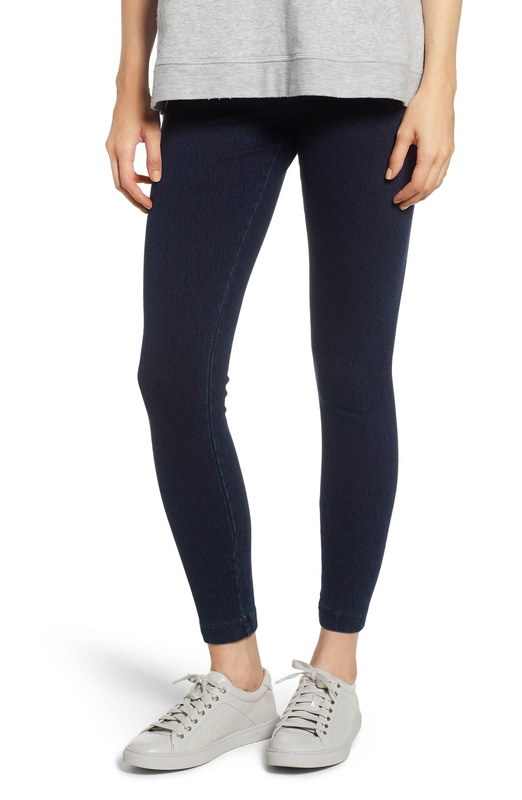 See it: Get the Lyssé High Waist Denim Leggings for $78 from Nordstrom! We can only accept these leggings as, well, leggings, because of just how stretchy and comfortable they are. Shoppers are loving the wide waistband, which sits and stays high on the high. One shopper complained that with other jeggings, they’re “constantly hiking them back up” as they droop and fall throughout the day, but that’s not an issue with their Lyssés. Another commented that these leggings are “much classier than real jeans,” which is a bold statement! Leggings classier than jeans? Now this we have to see, try on, and wear as long as possible. As we mentioned, these denim leggings are high-rise for an ultra-flattering effect, and are fitted throughout, falling right at the ankle. Because of the control and shape they offer, we’d expect these leggings to be thick, but they’re actually lightweight and easy to move around in! This means we can still wear them as we would a regular pair of leggings, a.k.a. sprawled out on the couch with a weighted blanket, our legs hanging over the cushions and Netflix asking us if we’re still watching reruns of our favorite sitcom. Ahem, the answer is still yes. Of course, we also grab our leggings for actual physical activity, so don’t be afraid to also wear these out for a walk or even to the gym! People may look and wonder if we’re crazy for wearing jeans to the gym (and how we’re moving so well in them), but they’ll have to ask if they want to know! So, we talked about the ways we can wear these Lyssés as leggings, but let’s get into how we can wear them as jeans without anyone batting an eye. For a dressier look, we can pair them with a ribbed sweater and a pair of pointy ankle boots. If we’d rather keep it more casual for an everyday vibe, we can slip on a pair of canvas Chuck Taylors and a relaxed white T-shirt. Done! Just like wearing a pair of skinnies, but without the uncomfortable stiffness that goes hand-in-hand with most denim. These leggings are currently available in three colors, but not for long. Red Dahlia, a statement color that would fit well with more muted tones, is almost gone! Luckily we still have Indigo and Black, at least for now. Indigo has the look closest to a dark-wash denim, nailing the texture and the seams. The Black shade also has subtle features that will easily make it nicest black legging in our closet. Lyssé’s philosophy is that rather than concentrating on age or size, “it’s about living.” That’s why the brand’s clothing is “designed to help women have fun, look great, and feel confident and carefree.” With these denim leggings, we’re hitting all of those points before we’ve even completely slid them up. We should feel carefree in our leggings and not have to worry about looking underdressed or having to surreptitiously pull them up when we think no one’s looking. That’s what gives us the confidence to rock our outfits no matter where we’re going. Shoppers are saying how they “had to buy a second pair” because they love these leggings so much. One said they “fit like a glove,” and others say that will be the case no matter what our body type or height. Even self-proclaimed picky shoppers are convinced after witnessing how well these leggings maintain their shape not only throughout the day, but after multiple wears and washes. These leggings fit true to size, so no need to waste time teetering back and forth, trying to decide what fit will be the best. We can just claim a pair and get started going through our closet to pick out any skinnies we’ve only been keeping because we felt like we had to. We don’t have to anymore, because our denim leggings are on their way! See it: Get the Lyssé High Waist Denim Leggings for $78 from Nordstrom! Not your style? Check out more leggings from Nordstrom here!